Choosing a career in the dog styling profession will give you the choice of being self-employed, or, of being an employee. This profession offers opportunities and flexibility nationwide. 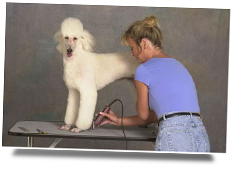 The demand for qualified dog stylists is greater than the supply. This short supply is the result from the profession being somewhat hidden, almost obscure from the public as a career choice. This obscurity on the other hand has created exceptional opportunities for people who love animals and who want an exciting and rewarding career in the pet care profession. Unleash your dreams! Now is the opportune time to make them come true! Have you dreamed of a career where you could work with animals? Have personal rewards along with financial opportunities? Have variety, creativity, and daily recognition? All of this along with being able to convey your love to the pets who are entrusted in your care every day? If this is your dream career, becoming a pet stylist is the answer. A pet styling career abounds with personal and financial rewards. Personal rewards come in four-legged packages, all sizes and colors, short hair, long hair, some shy and some outgoing. They come to you for their "magic makeover". A pet styling career offers exceptional employment or self-employment opportunities. A few of them are, a pet salon, a boarding kennel, pet retail, and mobile grooming vans. Pet styling is a career for special people who love animals, creativity and an active day! 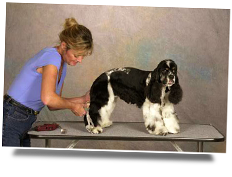 The Golden Paws Proprietary Method is and effective step-by-step Pet Grooming training Program designed by one of the nations top instructors, Jacqueline Rauch. 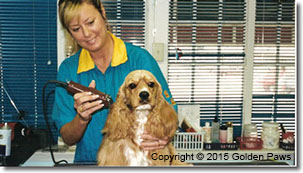 Ms. Rauch created the Proprietary Pet Grooming training Programs in 1969. 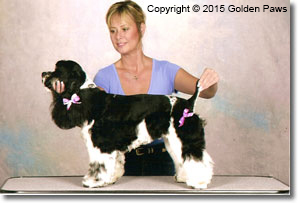 Mitzi Parrish and her mother Jacqueline have tested, refined and proven the training successful Dog Stylists over 5 decades. They continue to revise and refine the material to keep up with current trends and techniques. 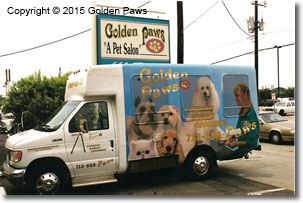 The Golden Paws Program is taught by experienced pet styling instructors trained and must be Approved by Golden Paws to teach at Licensed Golden Paws Pet Styling Academies. See School Locations (click Here) for Licensed and Approved Golden Paws Academies. 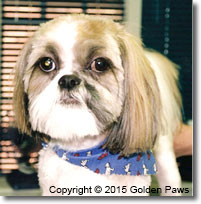 Search the web with "top rated Pet Grooming School near me." to call for a tour. Tour the school, meet the instructors, observe a class in progress, review the training program and begin your career! Become a "Golden Paws Humane Pet Styling Artist!". 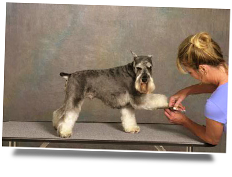 Mobile grooming is an exciting new concept in the pet care profession. This concept offers you the freedom and flexibility needed to create a more enjoyable environment. As a business owner you can structure your appointments to fit your lifestyle. You can book your appointments around, or, within other pressing personal appointments. Need an item for the house, or, family? Make quick stop along your route and pick it up. Need a vacation? Book your appointments around your vacation time. The mobile concept enables you to have some control over your career. As a mobile employee, you have a structured route and you are in charge of the daily operation. It is the next best thing to being in business for yourself. Get your own fully outfitted "salon on wheels" and be your own boss. See Pet Professionals on the navigation bar for extra income opportunities. Salon grooming is for the business owner who would like to develop a larger enterprise. In a salon setting, once the clientele is established you may want to maintain the current growth yourself or you may want to add a pet bather. To increase the growth and sales you may want to add other stylists. Pet retail items and oral hygiene products can also be added for extra income. See Pet Professionals in the navigation bar for income opportunities. Salon grooming gives you these choices. As an employee, the salon setting enables you to work with other stylists as a team. This support and camaraderie creates a warm, personal working atmosphere along with a nice income base. 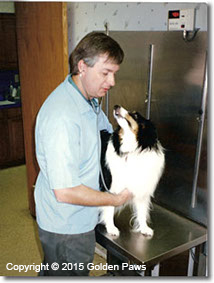 Boarding and grooming are the perfect match in the pet care industry. Pets who are boarded are normally bathed or groomed before their owners pick them up. As a business owner, a boarding kennel offers two strong incomes. For those who like the pet "Bed & Breakfast" concept, along with pet styling, this avenue is worth exploring. As an employee, the client base (depending on the size of the kennel) can offer you a strong income potential along with a nice working environment. Pet Shops and grooming are another perfect match. As a business owner this concept offers two strong incomes. The daily grooming brings in a steady clientele along with the retail sales. Puppy sales create future clientele when owners return for their pet's grooming and supplies. The atmosphere in the pet shop setting is one of fun with lots of activity which makes it a nice business for couples, or, for families who would like to build a business together. As an employee, the pet shop environment offers you a fun atmosphere to work in. Depending on the clientele, this concept normally offers you a strong income base.